Liz Oliver grew up in North Carolina and received her Bachelor's degree from Appalachian State University. For many years after, she continued her textile education with classes at different institutions, including Penland School of Crafts. After deciding to pursue a career in costume design, Liz took post baccalaureate courses at UNCC. It was here where she discovered her passion for dyeing fabric, and soon after decided to move to LA to become a dyer in the LA Motion Picture Costumer's Union. Liz currently works as a freelance textile artist in the film/tv industry for various costume designers. Within this job, she utilizes her excellent color matching skills, as well as painting and distressing. When she is not working on a show, Liz is exploring her love of pattern, color and texture through the art of Shibori. I am from North Carolina, so the beach and the mountains were never very far from me. Growing up in the south, where we spend most of our Spring and Summer outside, I felt a strong connection to the land and sea. I often would find myself in my grandparents backyard – close to the Blue Ridge mountains – laying in their hammock and staring up at the tree tops, or exploring the forests and rivers nearby. Amidst these landscapes, my imagination would run wild, focusing on all of the colors and textures that surrounded me. There is also a respected sense of tradition where I am from, so naturally I am drawn to the practice of Shibori. As a dyer, I work with water, which I feel largely represents who I am. Water is flowing and reflective, adaptive, nurturing and calming. As much as water can be soothing, it can also be unpredictable. 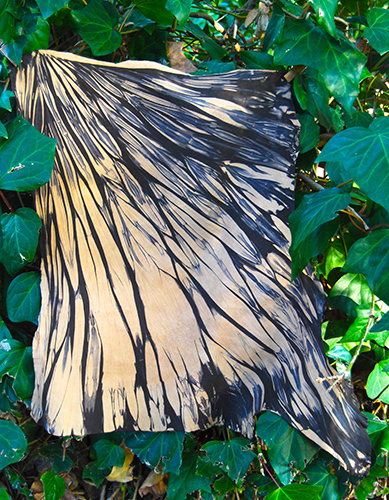 The element of surprise is one of the qualities that I appreciate most about Shibori. This medium encourages the explorer within. In my practice, I strive to honor the beauty of the natural world, while creating my authentic and intuitive voice through the long time art form of Shibori.